Citizens of the Ebola-affected countries are required to apply for a visa prior to being granted permission to enter the Seychelles. While Euros are widely accepted in the Seychelles, most prices will be displayed in Seychelles’ Rupees (SCR) and you may need this currency for transactions with local vendors. Euros, US Dollars and British Pounds can easily be exchanged at the airport, at local banks and at most hotels. Sun Screen / Aftersun Lotion – don’t spend your holiday nursing tender sunburns and hiding from our equatorial rays. Remember to pack plenty of sunscreen and to apply it regularly. Try to purchase an ocean-friendly brand of sun screen, whose ingredients will not contribute to coral bleaching. Snorkel Gear – the Seychelles’ marine environment is stunning at almost every location. While we do provide complimentary snorkelling gear at the hotel, we do recommend you bring your own, so that you can snorkel at leisure while exploring the rest of the island. A mesh bag – the Seychelles fine sand feels delightful between your toes, but less pleasant when collected at the bottom of your beach bag. 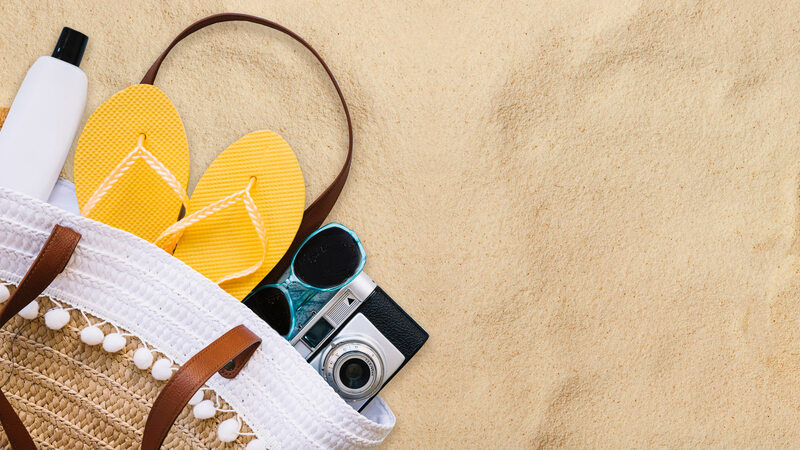 Carry your beach gear in a mesh bag, and simply shake the excess sand out, before you leave the beach. A waterproof cell phone pouch – the Seychelles’ turquoise waters are remarkably beautiful and you are going to want to take a lot of pictures of the ocean, in the ocean, maybe even under the ocean! Waterproof cell phone pouches are also a great way to keep fine sand out of the tiny holes in your device. The Seychelles’ equatorial position and congenial tropical climate makes is a year-round destination for travellers in search of summer sunshine. However, guests are advised to pack for comfort in generally humid conditions so that they may reap the full enjoyment of the Seychelles’ tropical environment. Pack light, easy-breathing clothes. The Seychelles can be quite humid at certain times of the year (especially from December to April) and light, comfortable, cotton garments are strongly recommended. Bring comfortable walking shoes. The Seychelles’ mountainous landscape and considerable nature reserves are home to some beautiful hikes and walking trails. Don’t miss out on these because you forgot to pack appropriate footwear. Natural insect repellent. As the Seychelles is a tropical destination, with a rich and unique biodiversity, our guests do sometimes experience run-ins with locals of the stinging and biting variety. Whilst these are harmless (the Seychelles is free from malaria and the Zika virus), they can cause irritation and we always have treatments and creams available to treat minor ailments. That said, we do encourage our guests to remember to bring a natural insect repellent with them, or to purchase some from our gift shop. We kindly request that you be considerate of other guests staying at the hotel and adhere to the hotel’s dress code, which requires guests to wear at least a T-shirt, a pair of shorts and footwear in all indoor public areas and restaurants. Kindly note that L’Indochine has a premium casual dress code, and guests are asked to dress elegantly, covering their knees and shoulders. Read more about when to visit the Seychelles and why the Seychelles is the perfect island getaway, here. For more information about currency, visa requirements or what to pack, please contact us at info.seychelles@kempinski.com or on +248 438 6666.